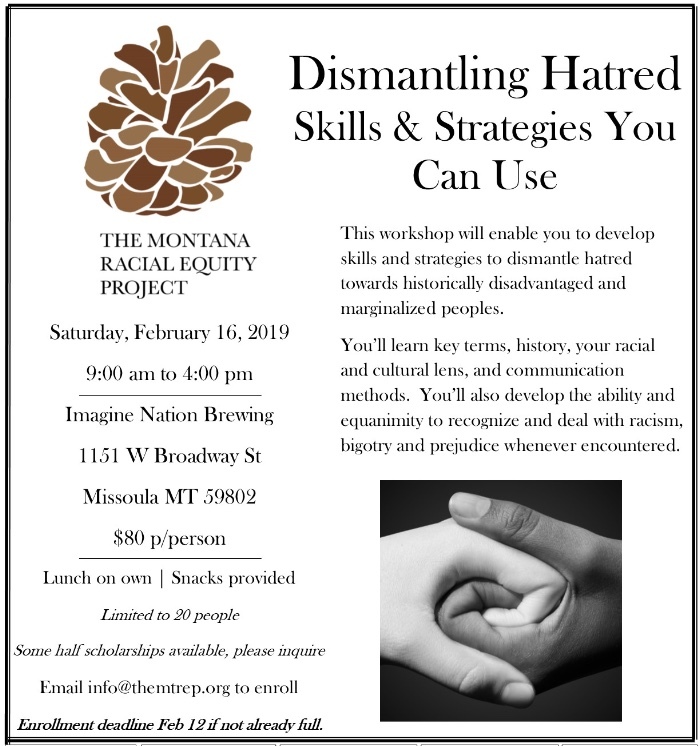 This workshop will enable you to develop skills and strategies to dismantle hatred towards historically disadvantaged and marginalized peoples. You’ll learn key terms, history, your racial and cultural lens, and communication methods. You’ll also develop the ability and equanimity to recognize and deal with racism, bigotry and prejudice whenever encountered. *FIVE half scholarships are available. Contact info@themtrep.org to be approved and receive the promo code. *Bring your own lunch; Snacks provided. Beverages (kombucha, sparkling water, soft drinks, etc) will be available for purchase from Imagine Nation Brewing. *Limited to 20 people. REGISTRATION DEADLINE is February 12th if not already fully booked. *Contact info@themtrep.org to get on our waiting list if the workshop is already full. *If you do not wish to register online please contact us to receive a registration form and instructions on how to enroll. *NOTE - payments are non-refundable for any cancellations after February 12th if no one is available to fill the reserved slot. Please email info@themtrep.org with any questions.